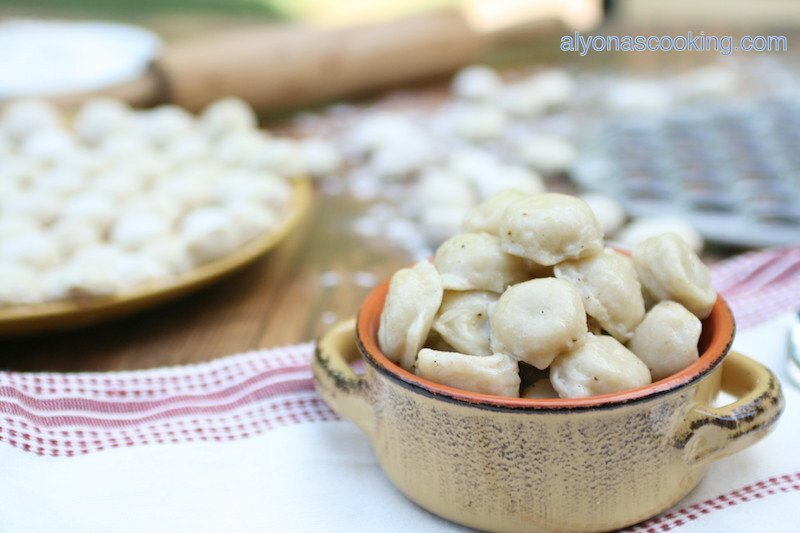 Pelmeni are traditional Slavic dumplings filled with a seasoned meat mixture. There’s so many different ways you can use these tasty little dumplings for, including a soup or as a dip for a buttered sauce and of coarse alone as is! This recipe makes about 11 dozen little dumplings, which fills about a gallon sized zip loc bag. The recipe calls for only 4 1/2 cups of flour which is a perfect sized batch (unless you want to double the recipe to make ALOT and stock up). These dumplings come out fluffy and slightly firm to the bite for the perfect al dente pelmeni. My mother got this recipe from a lady that probably makes these a lot (I mean who would have thought to use a zip loc bag for piping out the meat mixture?) I am so glad she shared this recipe with my mom because not only does the dough taste amazing but the filling is moist and so tasty with the perfect amount of seasoning (thank you tot Lyuba). 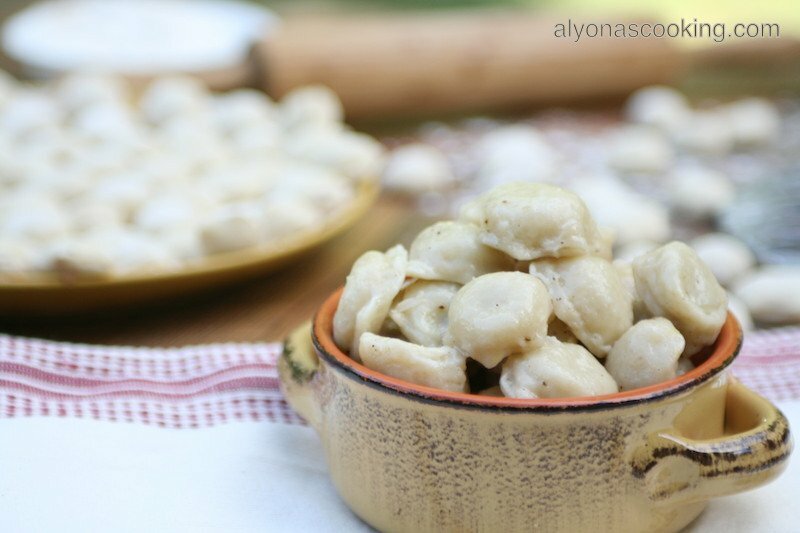 So here is the recipe of classic pelmeni, enjoy! Start with making the dough. In the bowl of a stand mixer combine: 4 1/2 cups flour, 1 egg, 1/2 tsp salt, 4 tbsp of oil, and 1 tbsp sour cream. Using the hook attachment to your mixer combine the ingredients over low-speed. Heat 1 2/3 cups of milk in the microwave for about 2 minutes. Slowly add warm milk to the flour and mix on low-speed until a soft dough forms, adding more flour or milk if needed. Dough should come together into a ball and will be slightly tacky. Cover dough and allow to rest while you prep the meat filling. 3. Place ground meat, 3 tbsp of half & half, 3 tbsp of water, 1/4 tsp of salt, 1/2 tsp of ground black pepper, and 1/2 tbsp of vegeta into a large bowl. 4. Peel and quarter an onion; place into a blender. Add 3 tbsp of milk and puree onion; transfer to meat mixture. Throughly mix meat mixture and place into a zip loc bag with one bottom corner snipped off; set aside. 5. Transfer the dough onto a slightly floured surface and form into a 12″ log. Slice log into 4-5 equal pieces, about 2.5″ wide. 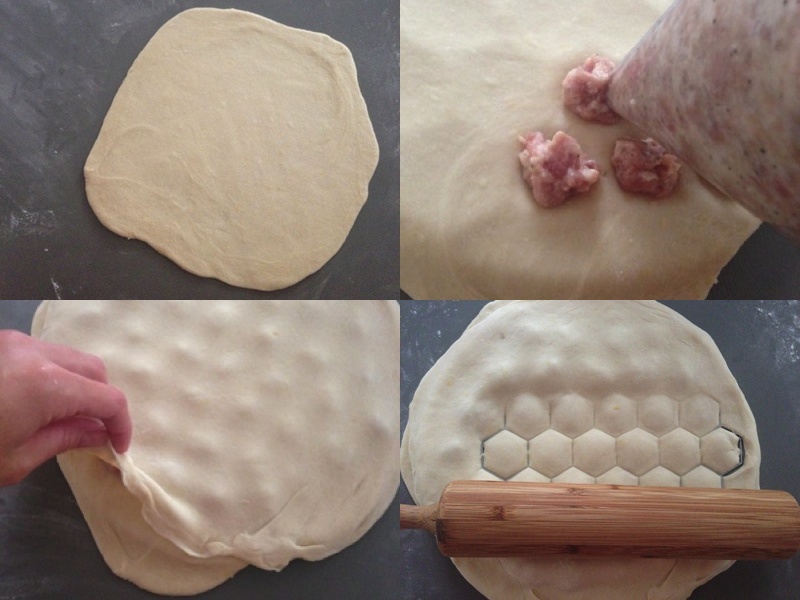 Roll out each piece of dough into an 11″ circle (or about an inch bigger than your pelmeni mold). Place rolled out dough onto a lightly floured pelmeni maker and pipe out the meat mixture into each little mold, about 1/4 of a tsp. Tip: Do not add too much meat filling, because the pelmeni won’t seal properly. 6. Place another piece of dough that has been rolled out over the filled in dough. Using a rolling-pin tightly seal the pelmeni and remove any excess dough from the mold. Save the excess dough for later as you will need to roll out the scraps too. Invert pelmeni onto a floured surface. Repeat until you have used up your scraps and dough. Note: It is important to dust flour as you work when needed. 7. Transfer inverted pieces onto a well floured tray and freeze, reserving the ones you want to make. Freeze on a floured tray first before throwing into a zip loc bag. Otherwise, you will have a big frozen block, if you throw unfrozen pelmeni in a freezer bag. 8. 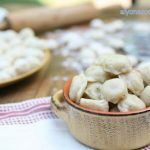 To make the pelmeni; bring a large pot of water to a rolling boil over high heat; add fresh pelmeni and boil for about 5 minutes from the time you throw them in. Boil 7 min if using frozen pelmeni. Or until they float to the tops and become fluffy. I like to toss my pelmeni in a some butter, a splash of vinegar and lightly season with salt & pepper. Serve with sour cream and enjoy! 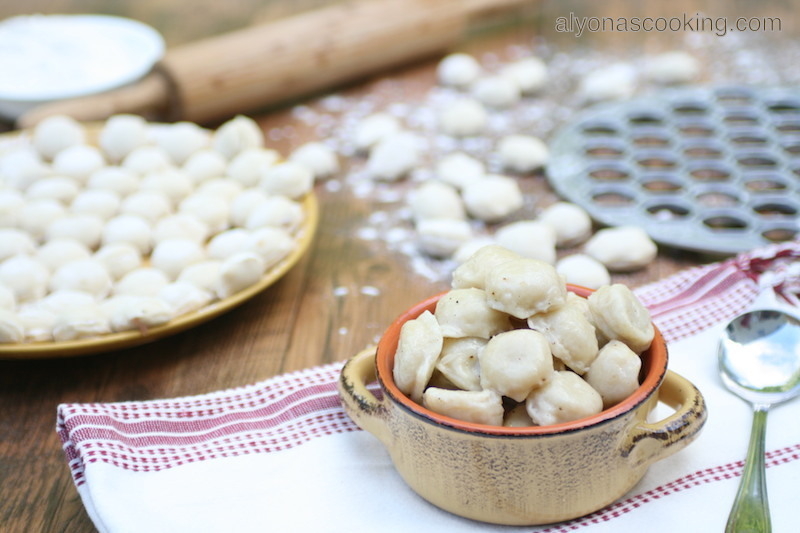 Pelmeni are traditional Slavic dumplings filled with a seasoned meat mixture. There's so many different ways you can use these tasty little dumplings for, including a soup or as a dip for a buttered sauce and of coarse alone as is! Combine, 4 1/2 cups flour, 1 egg, 1/2 tsp salt, 4 tbsp of oil and 1 tbsp sour cream in the bowl of a stand mixer and knead over low speed. Slowly add warm milk to the flour until a soft dough forms. (Dough should come together into a ball and will be slightly tacky.) Cover and allow to rest while you prep the meat filling. Combine ground meat, 3 tbsp of half & half, 3 tbsp of water 1/4 tsp of salt, 1/2 tsp of ground black pepper and 1/2 tbsp of vegeta into a large bowl. Peel and quarter an onion; place into a blender. Add 3 tbsp of milk and puree onion; transfer to meat mixture. Throughly mix meat mixture and place into a zip loc bag with one bottom corner snipped off; set aside. Transfer dough onto a slightly floured surface and form into a 12" log. Slice log into 4-5 equal pieces, about 2.5" wide. 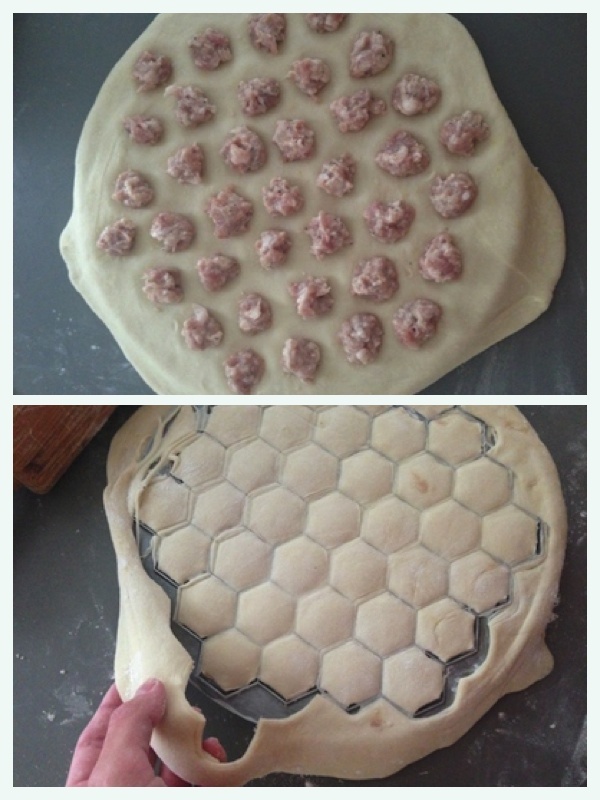 Roll out each piece of dough into an 11" circle (or about an inch bigger than your pelmeni mold). Place rolled out dough onto a lightly floured pelmeni maker and pipe out the meat mixture into each little mold, about 1/4 of a tsp. Do not add too much meat filling, because the pelmeni won't seal properly. Place another piece of dough that has been rolled out over the filled in dough. Using a rolling-pin tightly seal the pelmeni and remove any excess dough from the mold. Save the excess dough for later as you will need to roll out the scraps too. Repeat until you have used up your scraps and dough. Transfer inverted pieces onto a well floured tray and freeze, reserving the ones you want to make. Freeze on a floured tray first before throwing into a zip loc bag otherwise you will have a big frozen block if you throw unfrozen pelmeni in a freezer bag. To make; bring a large pot of water to a rolling boil over high heat; add pelmeni and boil about 5 minutes for fresh pelmeni and 7 min for frozen. Or until they float to the top and become fluffy. What is vegeta, where can I find it? Also the tray you used to prepare? My husband is Lithuanian decent, and I would love to try preparing this! Hi Lisa, Vegeta is an all-purpose seasoning that you can completely omit for these pelmeni. Im assuming you meant the Pelmeni mold for the tray, those you can find on amazon or eBay if you search pelmeni molds. Wonderful recipe. Ever since going to Russia in high school I have loved slovic food and pelmeni is one of my favorites. Have made this recipe twice now. The first time it turned out amazing, the second time, the filling was very watery. On the second batch I used pre-packaged ground pork and didn’t realize that it had broth added until it was to late. 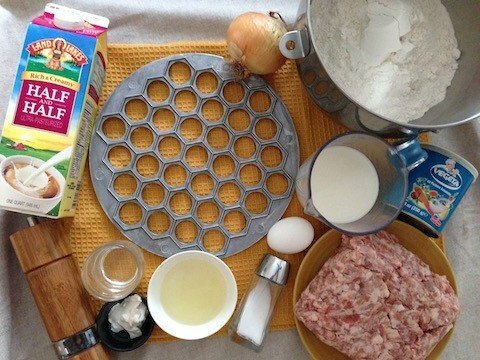 If you make this recipe find fresh ground pork for the filling otherwise it will be a watery mess. But the flavors in this pelmeni are amazing! Thanks for posting the recipe! Amazing recipe! Thank you so much for posting! I have loved slovic food since going to Russia in high school. Have made this recipe twice now. The first time turned out amazing. The second, filling turned out very, VERY wet. Used fresh ground pork the first time, and pre-packaged pork the second. The pre-packaged had pork broth added and I think that was the problem. 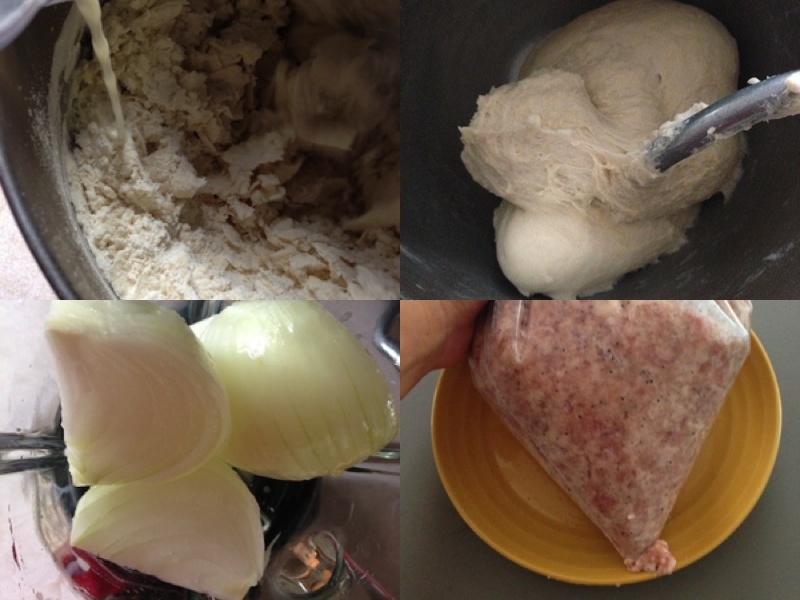 This is however an amazing recipe full of flavor and is one of my favorite slovic foods. Thanks for posting it! 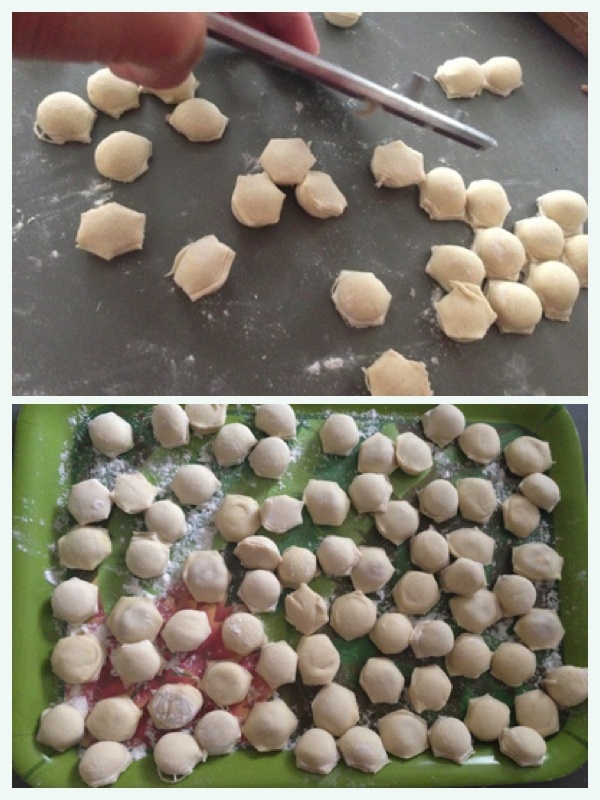 I was making pelmeni today. I made so much of it. So glad to learn this helpful trick ( zip back for filling) thanks a lot. Zhenya, thanks for sharing your experience:) I think the zip-loc bag idea is brilliant! Thank God for women who pass down helpful tips from there cooking experience.